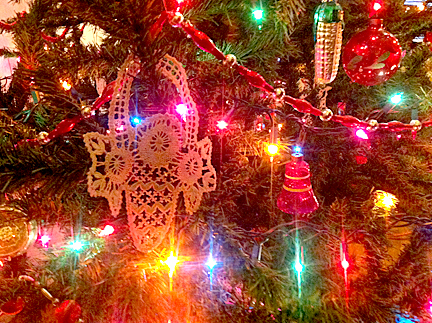 Christmas ornaments from the 1890s to now, including a tin nativity scene from Mexico (ca. 1972). Also: styrofoam découpage ornaments from the 1950s and German ornaments from 1963. There’s even one wooden, crudely hand-made piece of a swing with two people in it, from the 1910s (top row, center photo).